Haldighati is a mountain pass in the Aravalli Range of Rajasthan in western India which connects Rajsamand and Pali districts. The pass is located at a distance of 40km from Udaipur. The name 'Haldighati' is believed to have originated from the turmeric-coloured yellow soil of the area .Turmeric is haldi in Hindi. The mountain pass is historically a very significant location. It is the site of the famous Battle of Haldighati, which took place in 1576 between the Kingdom of Mewar and the Mughal Army led by king Mansingh. Maharana Pratap led the armed forces of Mewar against the Mughals who fought under the command of Mughal emperor Akbar's general Man Singh I of Amer Maharana Pratap's horse Chetak played a pivotal role in the Battle of Haldighati. Chetak was fatally wounded in this battle and died on June 21, 1576 .Maharana Pratap erected a small monument for his horse at the place where Chetak fell. The cenotaph still exists at Haldighati. Haldighati is also world famous for its charity rose product and the mud art of Molela. Much emphasis is being laid for promoting a private cottage industry by the Department of Tourism. Actually, Haldighati is a mountain pass in the Aravalli range connecting districts of Rajsamand and Pali in Rajasthan. The place is at a comfortable distance of 40 kms from the city of Udaipur. If you are interested in historic battles and heroic deeds of the courageous soldiers, then Haldighati is the perfect place to visit. Haldighati is a significant historical site that has observed the battle of 1576. 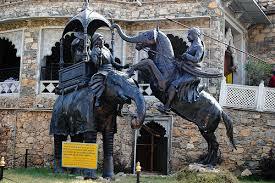 The battle of Haldighati was a huge combat between Rana Pratap Singh of Mewar and Raja Man Singh of Amber. This ferocious battle created amount of bloodshed of the heroic soldiers and the red turned colour of sand still speaks of those daring people. In the words of Col. James Todd (a British author), Haldighati has been referred as 'Thermopile of Mewar'. Haldighati is a place of interest for the people who value history and respect the heroes of India for their priceless efforts. Monday, 17th October: Staff had a meeting with the Principal regarding Annual Day. They decided about the program to be organized. Teachers were given duties according to Annual Day Program. All are working on their respective areas like dances, play, drama, music, exhibition, anchoring, etc . Tuesday, 18th October: In PDP session Staff with their group leaders uploaded the chapters that they had written so far. Each group gave their stories along with pictorial illustrations and it was uploaded in Google Drive. PDP session and group meetings were held regarding the beginning of new chapters. Staff filled the forms for membership in Learning Academy India. Diwali is festival of lights. Will impart knowledge for bright future days. 1. Who collaborated with his daughter lucky, in 2007, to write the children’s book Georges Secret Key to the universe? 2. Which authors break through books was described by Salman Rushdie as a book so bad it makes bad books look good? 3. Who declined the 1964 Noble prize in literature because he had consistently decline cut official honours? 4. Which authors book include coming up for Air, and homage to Catalonia? 5. Whose book The Empire Minpins was published in 1991, a few months after the authors deaths in 1990? 6. Which Italian novel for children has been adapted in over 240 languages? 7. Which famous novelist was Governal General of Canada? 8. Peter Mark Roget, a19th century British physician, is best known for what type of book? 9. Whose fourth novel featuring Robert Langdon, is a mistery thriller called Inferno? 10. Who wrote the 2012 Booker Prize winning book bring up the bodies? 11. In literature and films whose father was the Earl of Dorincourt? Friendly Cricket Match was played between students and staff in which the students won. The day ended with lots of fun and enjoyment. Monday, 17th October: Class VI-X students went practicing cycling every morning to prepare for their cycling trip to Jawai Bandh. 15 students escorted by Mr. Tarun Mishra cycle to nearby places like Dantiwara, Boya, Mundara etc. to develop strength. Mr. Partha Guin and Mr. Rakesh Kumar are other teachers who have joined the expedition. Monday, 17th October: Annual Day practices are in full swing. There was a change in Time-Table. School will observe one hour activity lesson to get started with exhibition preparation. 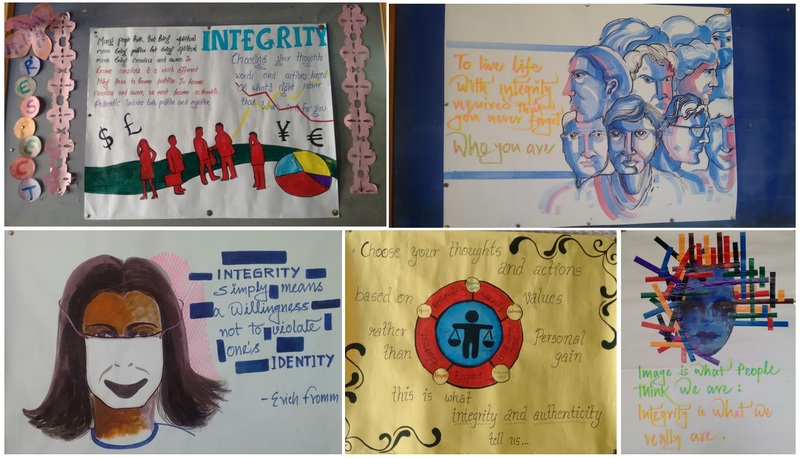 The campus is abuzz with hectic activity and cheer in preparation for school exhibitions. Students of Class V-XI are distributed among different exhibitions. They had started making projects, charts, models under the supervision of their respective in charges. Monday, 17th October - Friday 21st October: Monday, 17th October was celebrated as the English Literary Day. The whole week was celebrated as the English Literary Week. A number of activities were organized by the English Department both in the Assembly and classes. The activities carried out in the classes were Spell Bee, Quiz, Poster Writing etc. In the Assembly speeches were given, articles were readout, poems were recited and quiz was organized by the students all through the week. Monday, 17th October: Mrs. Bharti Rao spoke of the importance of English Literature in our life. She told the students that study of Literature allows people to develop new ideas and help individuals to present themselves as educated members of society. Studying Literature can be an eye-opening experience. She asked students to promise to speak in English, as people who speak fluently and orderly in always get first preference in every professional field. Krisha Dave/ VIII/ GH: Spoke about Suli Pradhumone, the first Nobel Prize winner in English Literature. Kreena Rao/VIII/ DH: Spoke about the Nobel Prize Winners of English Literature from 1921-2016. Ipshita Rathore/VII/RH: Recited a poem - The Daffodils by William Wordsworth. Mansi Choudhary/ VIII/DH: Quizzed the Assembly. Wednesday, 19th October: Students recited poems of famous poets and spoke about their works and their life. Kirti Malviya/X/DH: Spoke about Jonathan Swift and his works. 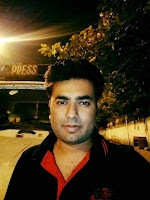 Chanchal Choudhary/X/DH: Spoke about William Wordsworth and his works. Pooja Dutta/XII/GH: Recited the poem “Where the mind was without fear” by Rabindranath Tagore. Recitation Activity was organized for Class I – V in their respective classes. Thursday, 20th October: Students recited poems of famous poets and spoke about their works and their life. Devika Choudhary/IX/TH: Spoke about R.K. Narayan and his works. Vinita Sirvi/VII/GH: Spoke about Mahatma Gandhi and his works. Blessy Maria/XII/DH: Spoke about Sarojini Naidu and recited her poem “Palanquin Bearers”. Kinjal Rao/IX/DH: Recited the poem “Seven Ages” by William Shakespeare. 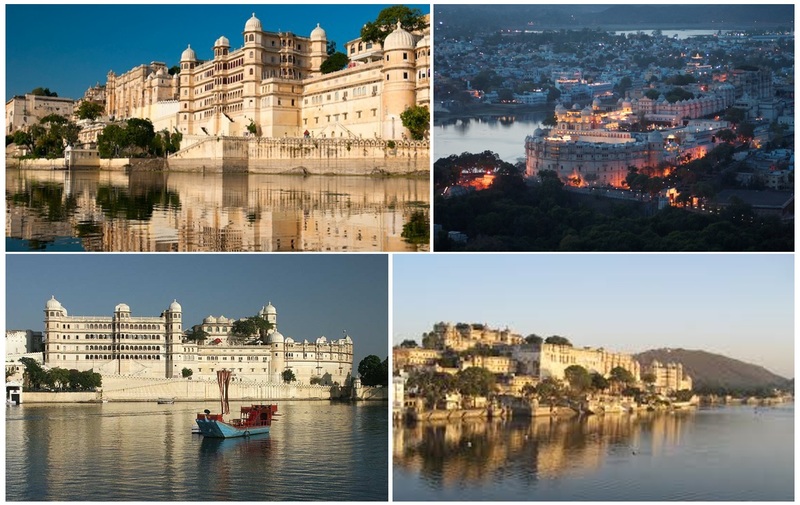 Udaipur is a very popular tourist destination known for its history, culture, scenic locations and the Rajput-era palaces. Udaipur was also voted as the best city in the world in 2009. Udaipur was founded in 1553, by Maharana Udai Singh II in the fertile circular Girwa Valley to the southwest of Nagda, on the Banas River. The city was established as the new capital of the Mewar kingdom. This area already had a thriving trading town, Ayad, which had served as capital of Mewar in the 10th through 12th centuries. The Girwa region was thus already well-known to Chittaud rulers who moved to it whenever the vulnerable tableland Chittaurgarh was threatened with enemy attacks. Maharana Udai Singh II, in the wake of 16th century emergence of artillery warfare, decided during his exile at Kumbhalgarh to move his capital to a more secure location. Ayad was flood-prone, hence he chose the ridge east of Pichola Lake to start his new capital city, where he came upon a hermit while hunting in the foothills of the Aravalli Range. The hermit blessed the king and guided him to build a palace on the spot, assuring him it would be well protected. Udai Singh II consequently established a residence on the site. In November 1567, the Mughal emperor Akbar laid siege to the venerated fort of Chittor. To protect Udaipur from external attacks, Maharana Udai Singh built a six kilometre long city wall, with seven gates, namely Surajpole, Chandpole, Udiapole, Hathipole, Ambapole, Brahmpole and so on. The area within these walls and gates is still known as the old city or the walled city. Saturday, 15th October: Staff had Annual Day Meeting after School. They discussed about the program, exhibitions and timings for the function. Duties were allotted to the Teachers. They were told to start preparation from Monday. Congratulations to Kavita Devda from Staff for her newly built house. The school staff was invited for lunch to Mrs. Kavita Devda’s farmhouse on Friday. Dussehra is a major Hindu festival. The other name of Dussehra is “Vijayadashami”. Dussehra festival generally falls around 20 days before the Diwali festival in the month of September or October. This festival signifies the victory of good over the evil, right over wrong, and virtues over vices. People celebrate Dussehra with all enthusiasm, pomp and show. Different people have their own distinct cultures. There are many mythological stories behind the great Dussehra festival. Once upon a time, the Prince of Ayodha, Prince Rama undertook 14 yrs of exile. When the exile period was about to end, Prince Rama killed the demon King Ravana. Thereafter, Prince Rama returned to his kingdom Ayodhya along with his wife Sita and brother (Lakshman). Here, Prince Rama stands for the good (virtuous) and the demon king Ravana stands for the evil (vice). This is one of the reasons of celebrating the Dussehra festival. The 10 day long battle between Prince Rama and Demon Ravana is enacted in dramatic form. This dramatic form of folk art is known as Ram-Leela. People of North India celebrate the Dussehra festival by depicting the fight of Rama and Ravana with the help of some masked dancers.The paperboard made effigies of three principal demons of the Ramayana, the ten- headed Ravana, Meghanada and Kumbakarna are filled with explosives. Rama burns the effigies with the help of fiery arrows. A fair is held on this occasion at various places. Thursday, 13th October: Special Assembly was organized in which Mr. Usman Gani gave an Assembly Talk in which he talked about the significance of Moharram and why it is celebrated. It signifies the first month of Islamic year. He said that it marked the struggle between Shia and Sunni sect. It is believed that during this month, while on a journey, Hazrat Imam Hussain, his family members and a large number of his followers were surrounded by the forces of Yazid, the Muslim ruler at that time. During their serge, they were harassed and tortured, even some of them were put to death. On the tenth day of Muharram a large procession called Tagiya is taken out In some parts of the world, drinking posts are set up temporarily by the Shia community where water and juices are served to all, free of charge. Thus, this festival is celebrated for 10 days starting from the first day of Muharram. 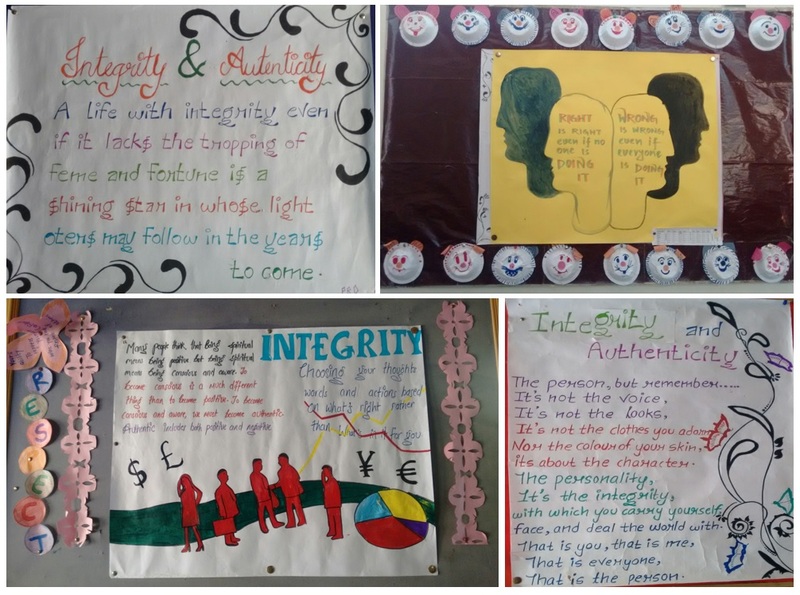 Students decorated display boards with the monthly theme.’ Integrity and Authenticity’. They wrote beautiful quotations and drew pictures to depict it. Saturday, 15th October: Special Assembly was arranged in which Manoj Roy and Vinod Rai from Pali showed their talent in Paper Craft. They made beautiful flowers, birds, design etc. out of kite paper and asked the children to learn it to decorate their classes. Chittorgarh Fort is one of the largest forts in India. It is a World Heritage Site. The fort, popularly known as Chittor, was the capital of Mewar and is today situated in Chittorgarh. It was initially ruled by Guhilot and later by Sisodias, until it was finally abandoned in 1568 after the siege by Emperor Akbar in 1567. It sprawls majestically over a hill 180 m (590.6 ft) in height spread over an area of 280 ha (691.9 acres) above the plains of the valley drained by the Berach River. The fort precinct with an evocative history is studded with a series of historical palaces, gates, temples and two prominent commemoration towers. These monumental ruins have inspired the imagination of tourists and writers for centuries. Chittorgarh Fort is stated that the fort was constructed by the Mauryans during the 7th century AD and hence derives its name after the Mauryan ruler, Chitrangada Mori, as inscribed on coins of the period. 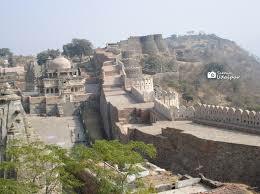 Historical records show Chittorgarh fort as the capital of Mewar for 834 years. It was established in 734 AD by Bappa Rawal, founder ruler in the hierarchy of the Sisodia rulers of Mewar. The fort was looted and destroyed at the hands of Emperor Akbar in 1568 AD and subsequently never resettled but only refurbished in 1905 AD. Three important battles were fought for control of the fort; in 1303, Ala-ud-din Khilji besieged the fort; in 1535, Sultan of Gujarat Bahadur Shah besieged the fort; and in 1567,Mughal Emperor Akbar attacked the fort. Chittor is cited in the Mahabharat epic. It is said that Bhima, the second of the Pandava brothers of Mahabaharata known for his mighty strength gave a powerful hit with his fist to the ground that resulted in water springing up to form a large reservoir. It is called Bhimlat kund, an artificial tank named after Bhima. Folk legend also mentions that Bhima started building the fort. We used to play hide and seek when the last block was under construction. In the year 2002, when we were in 8th std and 1 day before the annual function, the lead actor for the Lead drama of the function backed out and absconded. I was given the responsibility to take the lead role and learn all the dialogues in 1 day and executive in the main event. It was done successfully and better than the original one. Participating in the High school March past and singing competitions for Republic day/Independence day was always fun, and winning it was even more exciting. We used to request our teachers to teach in the open ground sometimes, it used to feel like a little picnic with studies and lot more. All these memories will always remain in my heart which I can never forget. I am thankful to all those who shaped me in The Fabindia School. School Staff had a meeting with Chairman, Mr. Sandeep Dutt. The agenda of the meeting was “Happy Teachers” how to have that in our School. The staff discussed one target that was Happy Teachers in School. That could be attained by working on the other four sections which were parents, students, freedom and target. After this, the staff had a PDP Session in which they discussed their chapters and how far the story had reached. Names were given to each group of the PDP Session. The staff promised to upload their finished chapters by 15th October. The whole week staff was busy making result, term-reports of SA I that had finished last week. Mr. Rakesh Kumar had his birthday on 2nd October 2016. We all wish them a very Happy Birthday. May God bless them with good health, happiness and prosperity! The Staff gives their Heartiest Congratulations to Mrs. Bharti Rao for completing her 12 Years in the School. Monday 3rd October: Special Assembly was organised on the occasion of Gandhi Jayanti. 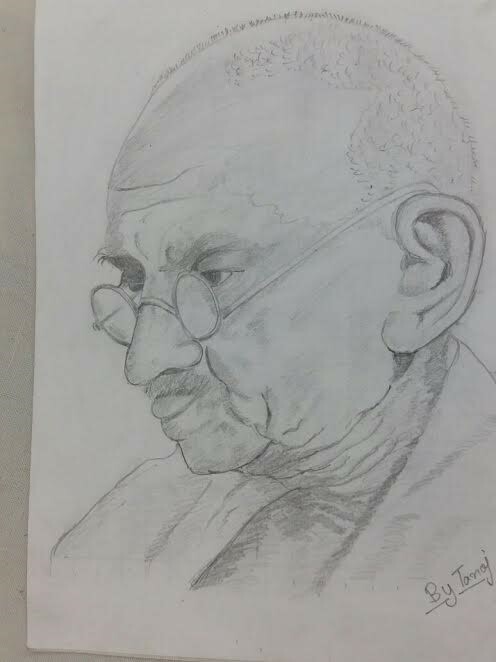 Tushar Diwakar/VII/DH made us aware of the history of Mahatma Gandhi. 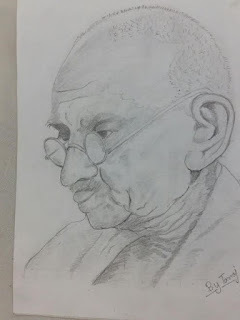 Suryaveer Singh/X/DH spoke about Mahatma Gandhi’s life. Some students of Class VI, VII and VIII performed a skit which depicted the Dandi March . And this is where you succeed. Bapu fought with British to protect us. Thanks Bapu for giving us freedom. Ed: In which field you are an expert? 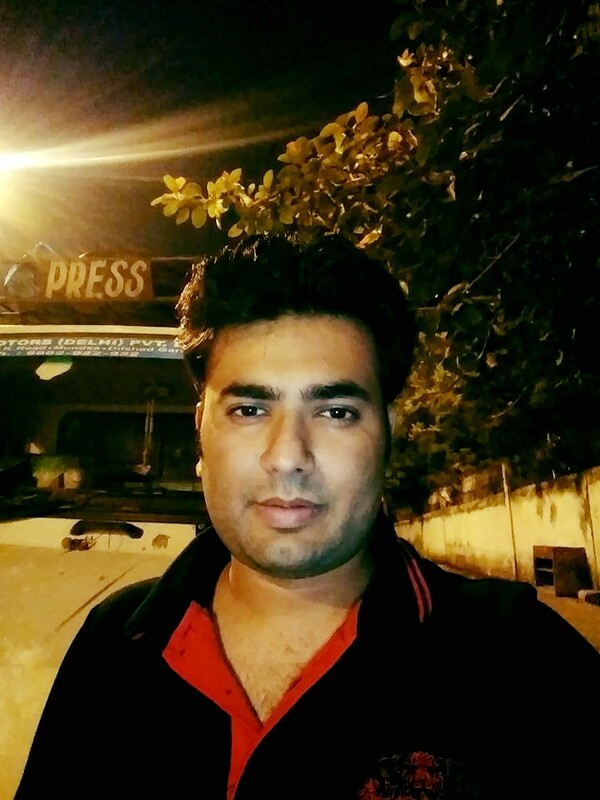 Vu: I have studied Journalism and I am working in Media and Education. Ed: If you get an opportunity to change any part of the school, which part would like to change? Vu: I think it is a perfect Green School, on sustainability. This school produces its own electricity; it has water harvesting system, so I think it is already perfect. Ed: What do you find different in our school? Vu: Vision of the school and the value system makes your school different from other schools. Ed: Who is your idol? Vu: I like lot of people, no specific person. Ed: What was your success formula? Vu: Our heart should be sincere and we should always listen to our heart. Ed: What are your hobbies? Vu: My hobbies are talking with children, walking and photography. Ed: What was your goal? Vu: Currently I want to work more and more with students, teachers and youth. Ed: What feedback would you like to give to the students? Vu: I want to say that love your school and always get engaged with your school. Wednesday, 4th October: Anumesh Rao/VIII/GH and Kinjal Rao/IX/DH appeared for Global Olympiad (English) and Himanshu Suthar appeared for Global Olympiad Cyber. The question paper consisted of 50 questions and students had to answer in the OMR Sheet. Saturday, 8th October: PTM (Parent Teacher Meeting) was organized for Class I to XII. About 50% parents attended the meeting. Majority of them were satisfied with their ward’s performance. Bus Service from their respective villages was provided for Parents to attend the meeting. Art & Craft, Music and Sports Activities were organized for Parents and Students in the Junior Campus. Parents and students together drew and coloured a painting of parent-student coming to school in the Junior Campus. Both of them sang songs and played musical instruments. 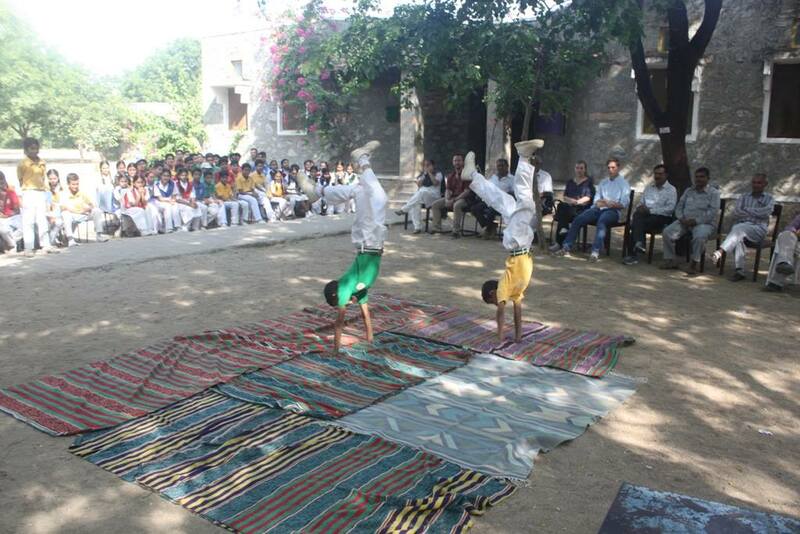 Many sports activities were like cricket, basketball, football and ring were organized for the parents and students. It was a new experience for both parents and students. They went home happy and contended. Thank You Mr. Parth Guin, Mr. Rakesh Kumar, Mr. Prakash Dangi, Mr. Tarun Mishra and Mr. Vineet Kumar for their contributions. It would have not been possible without their help. Kumbhalgarh Fort is a Mewar fortress on the westerly range of Aravalli Hills, in the Rajsamand district near Udaipur of Rajasthan state in western India. It is a World Heritage Site included in Hill Forts of Rajasthan. Built during the course of the 15th century by Rana Kumbha, Kumbhalgarh is also the birthplace of Maharana Pratap, the great king and warrior of Mewar. Occupied until the late 19th century, the fort is now open to the public and is spectacularly lit for a few minutes each evening. Kumbalgarh is situated 82 km northwest of Udaipur by road. It is the most important fort in Mewar after Chittorgarh. With a wall over 38 km long, the fort is the second largest wall in the world after the Great Wall of China and is known as the Great Wall of India and the second largest fort in Rajasthan after Chittorgarh Fort. Kumbhalgarh in its current form was built and ruled by Rana Kumbha and his dynasty who were Hindu Sisodia Rajputs descendents. Kumbhalgarh in its present form was developed by, and believed to have been designed by a famous architect of the era Madan. Out of the 84 forts in his dominion, Rana Kumbha is said to have designed 32 of them, of which Kumbhalgarh is the largest and most elaborate. Kumbhalgarh also separated Mewar and Marwar from each other and was used as a place of refuge for the rulers of Mewar at times of danger. A notable instance was in the case of Prince Udai, the infant king of Mewar who was smuggled here in 1535, when Chittor was under siege. The fort remained impregnable to direct assault, and fell only once, due to a shortage of drinking water, to the combined forces of Mughal Emperor Akbar, Raja Man Singh of Amber, Raja Udai Singh of Marwar, and the Mirzas in Gujarat. A Ganesh temple is built on a 12 ft (3.7 m) platform and is considered the earliest of all temples built inside the fort. Neel Kanth Mahadeva temple is located on the eastern side of the fort built during 1458 CE. The central shrine of Shiva is approached through a rectangular enclosure and through a structure supported by 24 huge pillars. The idol of Shiva is made of black stone and is depicted with 12 hands. The inscriptions indicate that the temple was renovated by Rana Shanga. Parsva Natha temple, Jain temple on the eastern side and Bawan (52) Jain temples and Golera Jain temple are the major Jain temples in the fort. Mataji temple, also called Kheda Devi temple is located on the southern side of Neela Kanth temple. Mamdeo temple, Pital Shah Jain temple and Surya Mandir (Sun temple) are the other major temples inside the temple. The creature of the Earth had made a fantastic thing on the Earth that is human and God has also given human some extraordinary powers by which he can decide what good or bad feeling is. The man is born to achieve something special in life and in the journey of life he faces many struggles, risks and happiness. When a baby is born then he is kept in the care of his mother and when he grows up he is sent to school or is taught the family occupation- many of them acquire success in their fields and many of them do not. Man’s life is the life which faces many problems and the person who comes across these problems leaves a sign on people’s heart and mind. Man takes birth without having anything and goes without taking anything but one thing that the man leaves is a sign of his attitude and achievement. During the journey of life people’s main focus remain on their aim that they want to achieve but these type of people cannot be called a happy human. 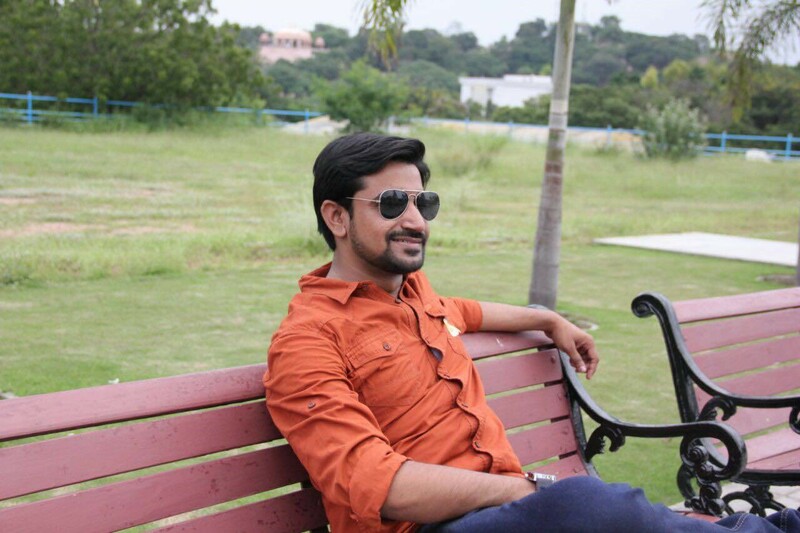 Happy human is one who works hard for his aim with the love and enjoyment of life and enjoys every second of life, and then the man can be called a happy human who is walking happily and enjoying the journey of life. Tuesday, 27th September: Ashley Madson and Carson Madsen along with their father Jason Madsen from Georgia, U.S. visited the School. The family had raised funds with bringing awareness about the school through information on videos amongst their family and friends. Thus they raised a huge amount and donated the School our existing Solar Plant (10KV). After an hour they went to Ranakpur escorted by Mr. Sandeep Singh. Mrs. Prerna Rathod, Mrs. Bharti Rao, Mr. Sandeep Singh, Mr. Tarun Mishra, Mr. Vineet Kumar, Mr. Parth Guin, Mr. Rakesh Kumar, Mrs. Rajeshwari Rathore, Photography Club and some students of Class VIII, IX, X and XI to visit Bali Fort .Madsen family loved the Bali Fort. They enjoyed watching the sunset scene! 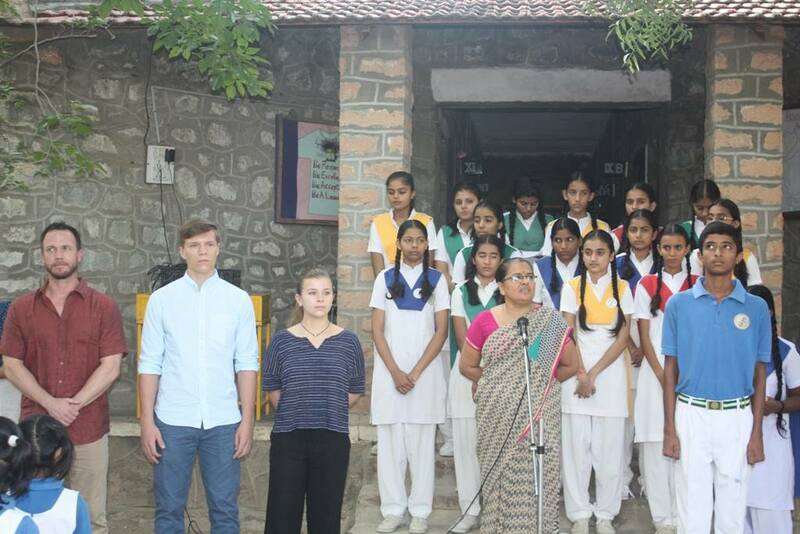 Wednesday, 28th September: A Special and Musical Assembly was organized to welcome the Madsen family. Mrs. Bharti Rao introduced the Madsen family to School. Mr. Sandeep Singh narrated the procedures School followed to install the solar plant. Ashley and Carson shared their experiences of how they raised funds. Blessy Maria/XII/DH briefed about the solar panel and how Madsen family installed it. Pooja Dutta/XII/GH briefed how generators caused noise and air pollution in the school. She explained how their elder son of Mackay Jason at the age of 13 raised funds and donated a solar panel to School in 2010 (3 KV) which supplied electricity to three blocks only. Mr.Byju Joseph gave a Vote of Thanks. Principal, Mrs. Deepika Tondon gave token of appreciation to the Madsen family on the behalf of The Fabindia School for the great honour. After Assembly Mr. Lakhmaram Choudhary, Municipal Chairman inaugurated the Solar Panel by cutting the proverbial red ribbon. Ashley and Carson switched ‘ON’ of the solar plant. Other invitees for the inauguration were Mr. Rajendra Singh Sandhu, B.E.O of Shiksha Vibhag. Mr. Ashok Wacheta, Nodal Officer. Cultural Program was organized. School Orchestra led by Mr. Prakash Dangi gave an enchanting performance. Welcome and Folk songs, Class IX and X girls performed a Folk Dance. A small skit was put up by Class VI and VII students, with a motive to teach “Save Environment”. Pooja Dutta / XII/GH mesmerized the audience by her soulful song. Mr. Lakhmaram Choudhary praised the School to save pollution and be awarded GSE for 70% audit. He talked on the advantages of solar energy and thanked the Madsen Family for going out f the way to help another country. Mr. Rajendra Singh Sandhu, BEO thanked Madsen family for donating the solar plant in our locality. He asked students to be inspired by Madsens and help those who are in need. It doesn’t matter if help given is small or big. Mr. Ashok Wacheta, the Nodal Officer motivated students to grow more trees and nurture them. He thanked the School for developing an eco-friendly environment. Mr. Jason shared how he enjoyed doing that project with his kids as he wanted to teach his kids to go beyond to meet certain challenges for oneself. In future also they will continue building this bond. The Principal thanked the Madsen family and guests for giving their valuable time to the school for such an important event. Briefly she described the installation of Solar Plant and thanked all for their hard work. All enjoyed the program specially the Gymnastic Stunts performed by the students of Class IV and V. Then Guests escorted by Principal, AD, Coordinators and HODs proceeded for High Tea to the Library where Mr. Sandeep Singh gave a presentation on Solar plant- how from selecting vendors to negotiating and transporting the panels, School had come a long way! Madsen Family visited school forest. After break met Class IX- XII. In the talk they shared their experiences, problems and fund raising for their project. Students asked them a number of questions. Then they visited Jawai Dam escorted by 10 students and teachers. Their trip was full of fun and they took unforgettable memories with them. Ed: Is this is your first visit to India? Js: I visited India in 2010 with my elder son Mackay when we came to install the first Solar Panel. We with the help of labourers in the scorching sun had installed it on the terrace of 5th Block. Ed: Do you like this place and its culture? Ashley: Yes, I love this place! Its culture is very unique. Carson: Yes, I like this place. Ed: Which are the places you have seen here? Ay & Cs: We have seen India gate in Delhi, Ranakpur, Bali Fort and Jawai Dam. Ed: What do you like the most in India? Ay & Cs: India’s Culture. Ed: What do you like the best in our school? Ashley: The Principal of the school, faculty as well as the students. Carson: The facilities which are provided to the students. Ed: From where did you get the idea of raising funds and installing solar panel in our school? Ay & Cs: We got this idea from our grandfather as this is our family project. Ed: What difficulties you faced while raising funds for the solar panel. Ay & Cs: While to find a good vendor was the biggest challenge for us and other is store battery. Ed: There are many schools in this area then also why did you choose our school this project? Jn: We decided to install a solar panel in school because of our good relationship with Mr. William Bissell and trust for this school. Ed: Did your friends help you in this project? Ay & Cs: No, we did not take their help but we went to their homes to collect money and their family donated money for the project. Ed: Suggest us some projects for our school? Ay & Cs: You can do projects specially related to environment as your school has a lot of greenery. Ed: Would you like to visit us again? Ay & Cs: Definitely we would love to visit you’ll again. Ed: If you get a chance to change anything in our school, what would you like to change? Ay: Your school is absolutely perfect. Cs: Your school is amazing everything is perfect here. Ed: Would you like to share your experience with us? Ay & Cs: We think that your Principal is very hardworking. She is doing well in up- bringing the school. We enjoyed here a lot and are proud to be a part of the Fabindian family. And love to visit here again and meet you all again. Although we had faced difficulties while raising funds and installing the solar panel but we are taking back very beautiful memories. Wednesday, 28th September: Students from classes 4 to 9 participated in a painting competition with Energy Conservation as the theme. The topic was classes 4 to 6 was "Save a watt to save a lot", while the topic for classes 8 to 11 was "Save the polar, go solar". Monday, 26th September: Students were shown corrected copies. 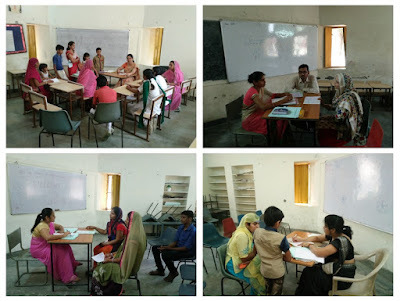 Oral Examination for Pre- Primary and Primary classes were conducted on 27th & 28th September. Friday, 30th September: Ms. Venus Upadhaya visited the school (Senior Communication Associate, Room to read). She was here to attend the Learning Forward retreat hosted by School for its India members and School staff. She visited the classes and interacted with students and teachers. She felt our students were excellent in praising their counter parts rather than praise themselves! Monday, 1st October: LFIN (Learning Forward India Chapter) met at The Fabindia School for its first retreat. The retreat started with a short introduction of the members. Twelve members were present for the meeting. Seven Teachers along with the trainers were divided in three groups. First everyone individually gave key terms for what is needed for Teacher Transformation Process. Then the groups gave presentation on the question what is a team and what can it do? Mrs. Prerna Rathod gave presentation on Professional Development Program and how it works at our School, for our staff. My Good School Philosophy was presented by the Mr. Sandeep Dutt, Ms. Venus Upadhaya gave a session on ‘Child a Special Mind”, and shared her experience of class observation. Skype Session was conducted by Ms. Meenakshi Uberoi, ‎Education Evangelist & Founding Director of De Pedagogics. While Mr. Manoj Jayarad and Ms. Devanjali Dutt interacted with the staff members through the session.